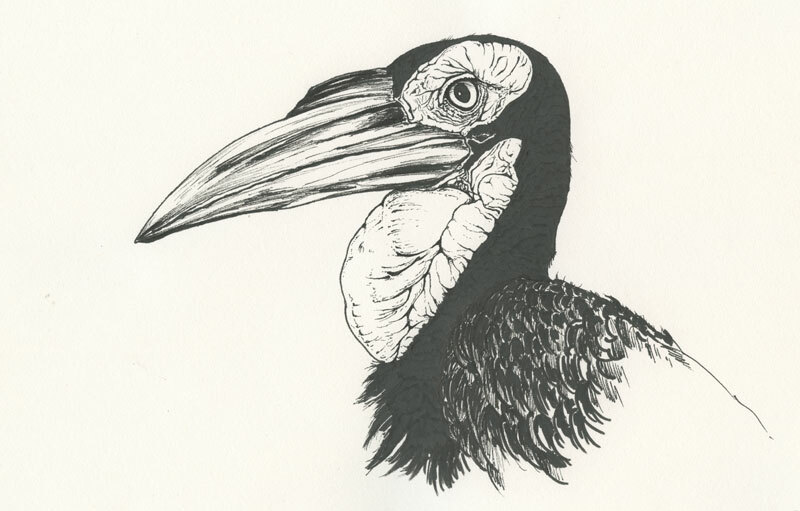 I just completed this ink drawing of a Southern Ground Hornbill just for fun. It was a while that I didn’t draw anything and I needed a fun drawing to warm up! It’s funny how its throat sac actually look like a brain… When I say “fun” in drawing it means pictures with lots of wrinkles and details that are for me very captivating to reproduce. It’s interesting how this drawing was done. The initial drawing didn’t have a lot of details and the bird actually looked like an ancient statue! Unfortunately I didn’t scan it at the time… I actually liked the rough better, it had more impact! A little background info about the southern ground hornbill: a pretty large flying bird that spends most of its time walking on the ground in the African savannahs. Looks like a very aggressive and carnivorous animal: it hunts in group outrunning its prey and it can actually rob eagles of their prey.